The Queen Elizabeth Queen's Grill Restaurant is a culinary delight. In fact I think it is one of the best restaurants at sea. Queens Grill guests can also enjoy The Steakhouse at The Verandah, however there is an extra charge to dine there. The Queen Elizabeth Queen’s Grill Restaurant is for the exclusive use of Queen’s Grill guests. In my opinion it is not only the best restaurant onboard, but one of the best restaurants at sea. The Queen’s Grill Restaurant reminds me of Simpson’s in the Strand. It has a classic yet elegant English decor with echoes of a by-gone era. The menu is traditional yet sublime. It does not have fussy nouvelle cuisine, rather exceptionally prepared classics. The menu changes daily, but there are standards which are available all the time. In fact, guest can even order off-menu. The chefs can prepare almost anything your heart desires, simply let the maître d’ know what you’d like in advance (usually during lunch time for dinner orders). White Sturgeon Caviar as served in the Queen Elizabeth Queens Grill Restaurant. One of the most popular dishes is the Duck L Orange. Your waiter carves the whole duck at the table. Then he finishes it with a flambéd Grand Marnier sauce. The Duck L Orange is the perfect size for two people to enjoy. A divine Mackerel Pate served on a Beetroot Purée. I also enjoyed the White Sturgeon Caviar with traditional condiments and blinis as well as the delightful Mackerel Pate. The traditional Rack of Lamb was excellent too. The chefs simply roast it with herbs so the sweet lamb flavour shines through. The dish is comes with a light gravy and mint jelly. Another popular dish is the Crepe Suet. This dessert is an off-menu item, but all the Cunard regulars know about it. Your waiter flambés the crepes tabled-side and serves them with homemade vanilla ice cream. It’s a nostalgic throwback to the 1980s which I adored. There is also a sublime Lemon & Lavender Cake with Clotted Cream. The Queen’s Grill Restaurant also serve a sublime Lemon & Lavender Cake. 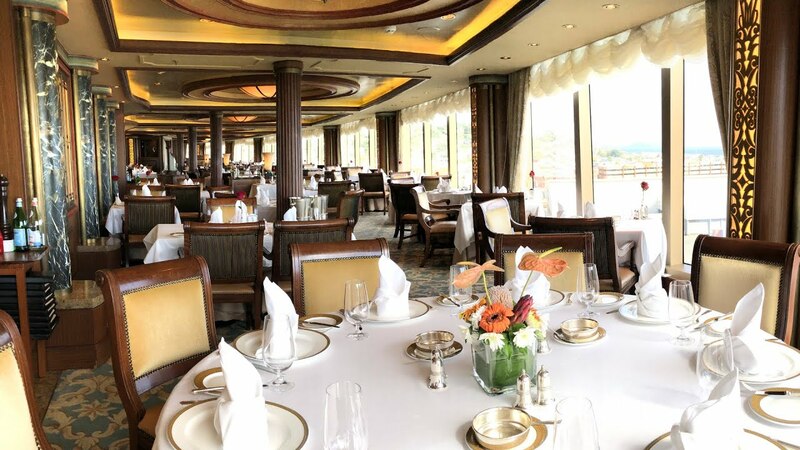 It’s worth noting that you will be assigned a table in the Queen Elizabeth Queen’s Grill Restaurant for the duration of your voyage. If you are unhappy with where they place you, simply alert the maître d’ who will do his best to find an alternate location. The Queen Elizabeth Queen’s Grill Restaurant is open from 6:30pm every night. The last order is taken at 9:00pm. However, you do not need to make reservations in the Queen’s Grill Restaurant. It’s worth remembering that you can dine al fresco in the courtyard too (weather permitting). The Steakhouse at The Verandah is a specialty restaurant onboard Queen Elizabeth. It is a great dining venue, but unlike the Queen’s Grill Restaurant anyone can dine there (for an additional charge). The name of the restaurant pays homage to the dining history of Cunard. In the 1930’s The Verandah Grill was the exclusive preserve of first-class passengers on Queen Mary. The menu includes prime steaks as well as classics like Maine lobster and Alaskan king crab. It also includes a British twist on the traditional steakhouse offering with Scotch grass-fed, dry-aged beef and Salt Marsh lamb rack. In addition, there is Australian Wagyu beef as well. I think The Steakhouse at The Veranda is a nice dining alternative for Queen’s Grill guests. However it’s worth noting that reservations are required. Also, there is a charge of US$25 for lunch and US$39 for dinner per person. I don’t think the other dining venues on Queen Elizabeth are in the same league as the Queen’s Restaurant or The Steakhouse at The Veranda. Indeed, the other restaurants don’t meet the dining standards expected by most luxury cruisers. There is the sprawling Lido Restaurant as well as the Garden Lounge. In addition, the Cafe Carinthia and the Golden Lion Pub serve light meals.